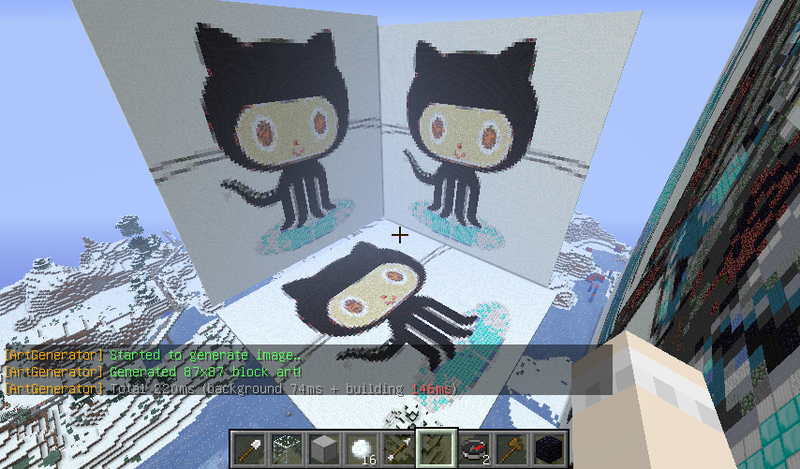 You can generate block(dot) art from Image URL or FileName on game command! Put the ArtGenerator.jar into your plugin folder and reload/restart your server. Open config.yml and make any changes you want, then use "/artgenerator reload" command. Use the Tickets tab to submit any bug reports or feature requests. Or Post them in this thread. Location: In another voxel game. Be very careful! Every pixel is one block, so a 2000x200 image will be ENORMOUS! Use this for low resolution pixel art only! Simple and great. But hasn't command "undo". Does this work with 1.6.2? I really want to use it. I really like the output of this plugin and the way it interprets which block most correctly represents each pixel. If there is some way to control which direction it builds when you run the command, that would be really helpful. Thank you for this plugin! I use this and i make a picture over the complett world.. i cant undo this can u make that we can delete or undo the pictures.. ? I didn't know that plugin. Thank you. that hasn't been updated in some time so I assume it's dead. It would be nice to see some of the features be implemented into your new plugin such as the undo function and scaling. Aww :'( This has no downloads.